Before the days of pagers and plectrons, firefighters had to literally rely on the “bells and whistles.” The first alarm was steam whistle at the Whitney Glass Works. The whistle proved to be unsatisfactory, as did its replacements. Finally in 1898, a 30 inch diameter, 325 lb bell was erected at Fireman’s Hall and used until 1910. In 1920, it was given to the Glassboro Board of Education and used for many years at the Academy Street School. On March 17, 1975, a fire destroyed the Academy Street School bell tower and the bell was removed. It is now on display at Bullock School where it symbolizes two things–calling men to fire duty and calling children to school. Along with the bell and subsequent horns, the phone company was an important resource for early firemen. Bell Telephone operators would relay fire locaitons to the firemen. This was done with the addition of a Portable Road Telephone which was added to the deparment’s equipment and was used from 1920 throug h 1936. Pictured at right is Joseph Seibert with the road pole phone relaying the message to Walt Dunham. 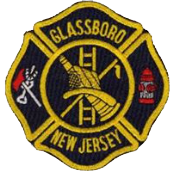 Today, after technology brought about two-way radios and plectrons, all Glassboro members now carry pagers, which optimize response time.